Mortality is a sentence passed on all of us, two- and four-footed alike. There are temporary reprieves, but there are no pardons. If we read a book and really like the protagonist, we hope that the sentence won't be carried out while we're watching. We can pretend that time is frozen when we turn the last page. 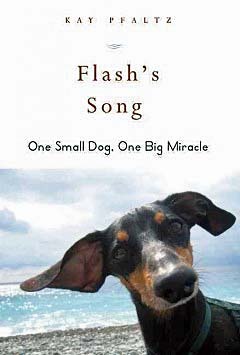 So let's make it clear right now – and it's scarcely a spoiler – that we don't get our wish when we read Flash's Song: How One Small Dog Turned into One Big Miracle by Kay Pfaltz. But the subtitle is accurate. Mortality does not preclude miracles. Kay Pfaltz lets us watch them happen. "I don't ever want another dog." Many of us have said that after the death of a much loved dog. That's where Ms. Pfaltz is in her life when the book begins. But she has a sister who knows better than that, which is how, one October day, she finds herself in the parking lot of a Barnes & Noble accepting delivery of a smooth black dachshund, resembling "a large salamander," who had been flown to Virginia from Arizona, where he had been dumped for a car. And, as one of the customers in her shop/café says, "I guess we find love where we can. And love finds us when it's right." Flash joins Ms. Pfaltz in a period of emotional turmoil for her, and, as dogs are wont to do, he makes the turmoil easier to bear, sometimes by just plain love and sometimes by being enough trouble to take her mind off her other concerns. Then, one November day, Flash is rushed to a clinic for back surgery. What was supposed to be normal IVDD turns out, instead, to be an inoperable tumor. And sentence is passed. Flash will live another two weeks. Three at most. And that's where the path to miracles begins. You know that the word "miracle" is in book's title, and you want, desperately want, the fairy tale ending, even though you know that the book is non-fiction. And you get miracles, even if not the one you want. The miracles come slowly, as Ms. Pfaltz explores various purported homeopathic cures and gratefully accepts the days that are given to her to be with her beloved boy. He makes it to Thanksgiving. He makes it to Christmas. She wants him to see the flowers bloom in her backyard in the spring, but that seems so much to ask. This is not a suspense novel, but we will still allow you to follow the spiritual journey – for this is a deeply spiritual book – of Ms. Pfaltz and Flash for yourselves. On the journey, she discovers, accepts and embraces her own feelings and destiny, just as she does for Flash. Flash loved to sing, and in this book you will hear his song in happy times and sad. You will hear it still once you've closed the book. Get yourself a copy, listen to Flash singing, and experience the miracles for yourself. Click here to order a copy of Flash's Song from Amazon. 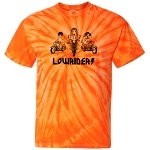 Thank you for loving those long, low, rubbery little 'so-called' hounds! Small as they are they each have enormous personalities, don't they? And thank you for purchasing Flash's Song and spreading the word. 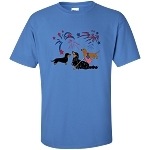 Because not all dachshunds, dogs, and animals have as comfortable a home as yours and mine, I donate all profits from Flash's Song back to the animals (as listed on my website www.kaypfaltz.com). When you buy a book, you are helping. Let's all support shelters and rescue groups.